When passing through Glide, one can’t help but slow down to enjoy the sweeping vistas of forested ranches. Tucked among acres of the moss-green Cascade foothills of southern Oregon lies this tiny, no-traffic-light town. There are mountain views from the elementary school playground and the community seems to know each other by name, yet even in this idyllic community, the school district of just under 700 students faced a staffing crisis a few years ago. Several departing teachers, combined with retirements, found the district needing to replace 20 percent of their staff in a short period of time. With this influx of new educators, Glide Education Association President Lynn Hill saw both a challenge and an opportunity. Allison Whitworth, a longtime teacher at Glide Elementary, has mentored new teachers coming to the district. Hill met with a group of educators to develop an action plan. Their idea was to pair veteran educators with new teachers who had less than three years’ experience in the district. This allowed educators who have taught elsewhere to be eligible to benefit from this resource. Hill ran with the idea and applied for a Professional Practice Organizing grant from OEA’s Center for Great Public Schools, and the next year, their mentorship program was up and running. Now in its second year, Glide’s new educator mentorship program has helped 16 teachers prepare for a career in the district with the help of 18 mentors. Sandra Wright is in her second year of teaching first grade at Glide Elementary School and took part in the program. Another mentorship recipient, Kelli Long, teaches 5th grade at Glide Elementary School. She says the program has helped her improve her practice. 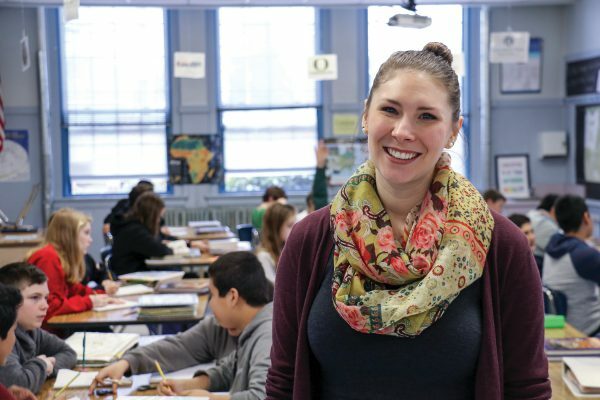 “It has connected me to people I can turn to for help on practical things, like classroom management and paperwork, while also helping me refine what I am doing in the classroom,” she says. Allison Whitworth has been a teacher-mentor both years of the program. She believes that having access to these kinds of experiences is important because teacher preparation classes at the university level can only prepare you for so much. “There are some things that you can only learn in the trenches as you’re going through and teaching children,” she explains. Even though she is a “veteran” teacher, Whitworth says the program has helped her continue to grow in the profession. “We get to learn from each other. They bring a new excitement to my teaching,” she says. The success of the program has led to a continued investment from the district. Glide School District agreed to sponsor time for classroom observations, evaluations, and discussion between the new teachers and their mentors. Administrators have also approved a paid “jumpstart” day for new educators to spend in their classroom before the start of the school year. This day gives them time to ensure technology works and their classroom is ready for the new year. On in-service days, the entire group regularly gathers for lunch to talk about life, in and out of the classroom. Lynn Hill hopes the spirit of comradery will continue without the support of a grant. “My dream is that our program carries enough value that teachers and the community will ensure it carries on regardless of funding,” Hill says. The success of Glide’s mentorship program is clear, even to an outsider. Staff members convey genuine companionship as they walk the halls of Glide Elementary, greeting each other on a first name basis. Teaching tactics are often shared. After a few minutes in a new educator’s classroom, it’s easy to guess who their mentor teacher was. The program gives them the confidence to help students succeed. Two OEA members are leading the profession using innovative teaching practices to help students reach their full learning potential, starting from the ground up. Stephanie Gately and Debbie Wright are teaching partners in a shared K-1 class at Sojourner Elementary School in the North Clackamas School District. They saw the generic seating in their classroom, with identical hard chairs (often so tall that kids’ feet couldn’t reach the ground) grouped around tables, and noticed their students fidgeting, tapping their feet, and adjusting their positions frequently. They began to wonder if there was a better way to help these young children stay focused during lessons. After researching the benefits of alternative seating options, they set a professional development goal of building a classroom where students are focused on learning, instead of sitting still and looking ahead. So, Gately and Wright decided to turn their thoughts into actions. Through their UniServ Council, they applied for a Promising Practices grant from OEA’s Center for Great Public Schools, which provided the funding for them to purchase 16 balance balls. 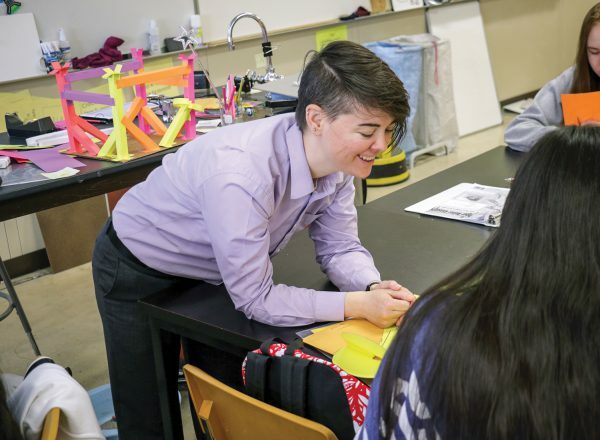 The teaching partners have 56 students in their shared classroom, which is partially divided by a wall to separate Gately’s art and science-inspired area from Wright’s reading and writing environment. Throughout the day, students rotate between the two rooms, with occasional periods as a large group taught by both teachers. Walking between the two sides of the classroom, you can see each of their personal inspiration. The walls and ceiling of Gately’s room look like a movie set of a classroom, brimming with colorful artwork and flourishes. Wright’s room showcases the creative writing of her students, with pages of their work covering the walls. The most immediately noticeable thing, however, are the kids swaying on bright pink yoga balls scattered around the classroom. In addition to yoga balls, they have also set up inflatable seat cushions, stools, and elastic chair straps for fidgeting legs. Gately believes that having alternative seating options allows students to choose the type that best suits their learning style. “They’re choosing the seating that best helps them concentrate. Some choose a stool; some choose a wobble seat. Some choose a regular chair,” she explains. “Giving them the choice of seating has created positive outcomes in their learning.” Giving these choices encourages students to think deeply about what they need as learners. “It allows them to grow and thrive in the opportunity they create for themselves,” Wright says. Gately and Wright hope to continue pushing the limits to improve student learning. Next year, they want to experiment with variable table heights. For them, it is about empowering students to choose the environment where they can focus on learning. Early Career Leadership Fellow Kelsy Dunlap of McKay High School. When Mindy Merritt meets new educators, she often tells them that their association is much more than a contract – it’s the power of thousands of educators who come together to do what’s best for students. “Our association is strong because of our collective voice.” she says. Merritt is the President of the Salem-Keizer Education Association. SKEA is not only Oregon’s third largest local association but also one of the most racially and socioeconomically diverse. It can be an overwhelming experience being a leader for new teachers in Salem-Keizer, but Merritt wants to make sure that they feel the support of their union early on. Merritt was not simply satisfied with preparing them for the challenges of the profession — she wanted to encourage early-career leadership within SKEA. She hoped to create an outlet to harness the passion new educators have in their first years of teaching. The Early Career Leadership Fellows (ECLF) is a National Education Association cadre comprised of new educators who are ready to take on a new challenge and develop as leaders in their association within their first five years teaching. The SKEA leadership team learned about the ECLF program while attending a Teacher Union Reform Network conference and realized the opportunity for their local. With the help of ECLF Coach Maraline Ellis, SKEA was awarded a grant to recruit 10 fellows for the program. They did not anticipate the number of members that would want to apply, however, and received over 40 applications. Merritt dreaded the thought of telling dozens of new educators that she did not have the resources to help them develop their leadership potential. With the help of a Professional Practice Organizing grant from OEA’s Center for Great Public Schools, she found the solution. SKEA would create a support system open to all early-career educators, led by ECLF participants. As the program concludes its first year, fellows are excited to continue their leadership within Salem-Keizer. Amanda Asp is a 7th and 8th grade social studies teacher at Parish Middle School, and a participant of ECLF. 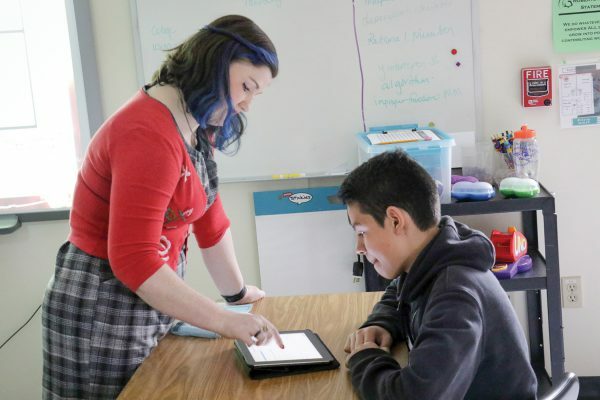 She says the program has helped both educators and students by “allowing us to identify what we need as early-career educators and what our students need to be successful,” she says. 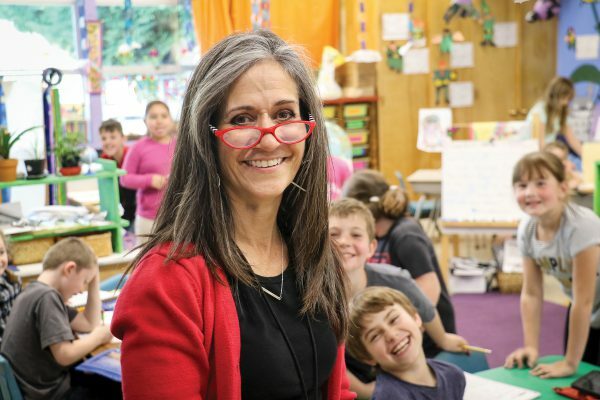 Ruth Ames teaches middle school at the Roberts Structured Learning Center, which houses alternative education programs for the Salem-Keizer School District. She says that almost every one of her students has experienced trauma in their life. This creates a maze that she must navigate to connect with each individual child. “At their core, each of the them are still children who want to learn,” Ames explains. Early Career Leadership Fellow Amanda Asp of Parrish Middle School. The first round of fellows has already shown great promise in leadership roles for their local. “Currently we have two fellows serving as SKEA board members. One member represented the voice of early-career educators on the bargaining team, while another member served on a joint committee with our district on our evaluation committee. Nine went to OEA RA as delegates. Two will serve as NEA RA delegates,” Merritt explains. Merritt plans to re-apply for the ECLF grant next year to develop another cadre of new-leader support, but regardless of the program’s future, she wants to ensure that SKEA continues engaging and developing new teachers. “Our early-career educators are a foundational cornerstone to the success of public education,” Merritt says. Through ongoing association events and experiences, her intention is to make sure the collective voice of the local includes its newest members. As these stories illustrate, OEA members are leading the way to find new, creative ways to improve student learning. Colleen Mileham heads OEA’s Center for Great Public Schools, which seeks to empower educator-led initiatives that support teaching and learning. She wants members to turn to their union as they seek innovative instruction methods and professional learning opportunities. The Center for Great Public Schools is emerging as a major player in educational professional development in Oregon, thanks in part to the tremendous effort of teachers and OEA professional staff. “The Center staff and teacher leaders are our best ambassadors in getting the word out about the support OEA provides for teaching and learning,” Mileham says. She wishes more educators knew about the work. “We are trying to encourage more members to come to us with ideas for improving student learning,” she says. Early Career Leadership Fellow Ruth Ames of Roberts Structured Learning Center. In addition to professional practice grants, local associations are forming task forces around the implementation of Every Student Succeeds Act (ESSA). Teacher-leaders are probing traditional classroom assessment and addressing critical issues in special education. Educators are holding town hall-style symposiums to address institutional racism in our public schools and focusing on culturally responsive teaching and learning.